2018 Australian of the Year is a travelling exhibition, currently on display at Geelong Library & Heritage Centre until 4 August, 2018. This exhibition showcases each of the eight state and territory recipients. It features personal stories behind each recipient's inspiring achievement and respective items of significance. 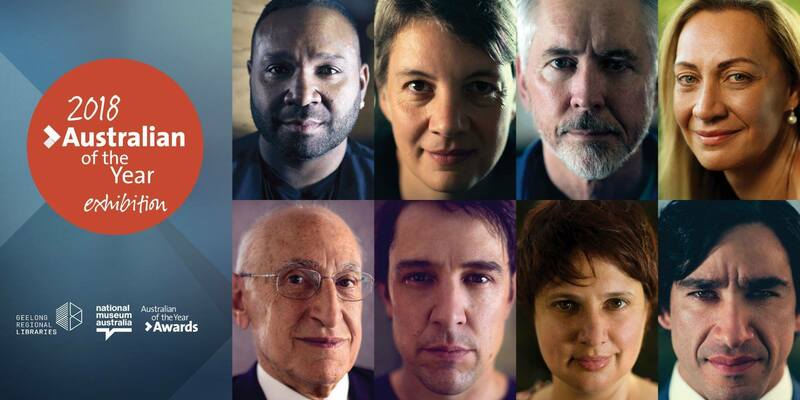 The 2018 Australian Of The Year recipients were NRL Footballer Johnathan Thurston (QLD), Professor Michelle Simmons (NSW), Actor Samuel Johnson OAM (VIC), Theatre Director Scott Rankin (TAS), Professor David David AC (SA), Psychologist Doctor Tracy Westerman (WA), Entrepreneur Mark Devow (ACT) and Paediatric Cardiologist Doctor Bo RemÃ©nyi (NT). Opened daily and is FREE, it's the only presentation of its kind in Victoria. Visit Geelong for this exclusive exhibition to learn about these remarkable people.